Golden Key With Puzzle Piece On Chain Security PowerPoint Templates And PowerPoint Themes 1012-This PowerPoint template consists an image of two golden keys attached to a jigsaw puzzle piece. This image refers the concept of solution. It portrays the concept of finance, house, insurance, interest, investment, jigsaw, key, mortgage, problem, prosperity, puzzle, service, solution, success etc. This image has been conceived to enable you to emphatically communicate your ideas in your Business PPT presentations. 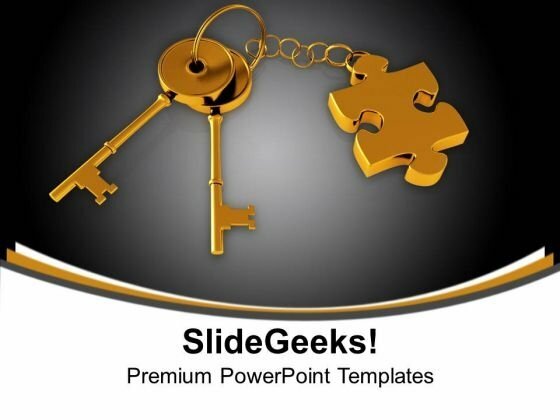 Deliver amazing presentations to mesmerize your audience.-Golden Key With Puzzle Piece On Chain Security PowerPoint Templates And PowerPoint Themes 1012-This PowerPoint template can be used for presentations relating to-"Golden Key With Puzzle, Security, Business, Chains, Symbol, Process and flows" You will rarely find fault with our Golden Key With Puzzle Piece On Chain Security PowerPoint Templates And PowerPoint Themes 1012. They are designed by a fastidious team. Expound on your field of study with our Golden Key With Puzzle Piece On Chain Security PowerPoint Templates And PowerPoint Themes 1012. Familiarise them with what you have dug out.